Most similar in appearance to crappie, but the flier has 10-13 dorsal spines. Deep-bodied and saucer-shaped. Generally olive-green to brassy in color. Numerous black spots on sides arranged in rows on adults; interrupted rows of black spots on young. Young fliers have a large dark spot with an orange margin in the rear portion of the dorsal fin that gradually disappears as the fish gets older. Total length: 5 to 7 inches; maximum about 8 inches and 1 pound. Prefers quiet, clear bodies of water with little current and considerable aquatic vegetation and mud bottom. 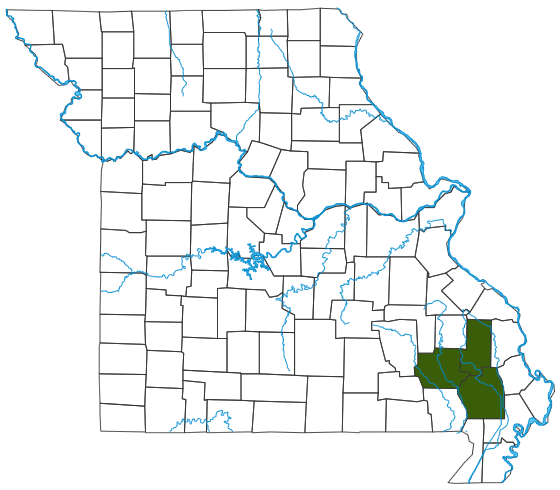 In Missouri, these habitats are usually found in sluggish pools of streams, backwaters, oxbows and bayous. Inhabits swamps, streams, ditches and borrow pits with clear water, dense vegetation and little or no current. Young feed mostly on small crustaceans with aquatic and terrestrial insects increasing in the diet as fliers increase in size. Fliers larger than 7 inches feed primarily on insects with fish and crustaceans making up a lesser percentage of the diet. Largest populations are at Duck Creek Wildlife Area and nearby Mingo National Wildlife Refuge, where extensive areas of standing-water habitat remain. In Missouri, a Species of Conservation Concern. Uncommon and sporadic in distribution. Ditching and draining of the Bootheel's lowland swamps has eliminated much of this fish's ancestral habitat. Fliers live up to 7 years. Ichthyologists from Virginia, where fliers are commonly found, have speculated the dark spot found in the rear portion of small flier’s dorsal fin, when coupled with their eye gives the appearance of a much larger fish when viewed from above. This adaptation is believed to deter potential predators like herons. Because of its small size and limited distribution in Missouri, the flier is of little interest to anglers. South and southeast of here, where the flier is more common, some anglers catch them with fly fishing tackle because of this species’ habit of hunting for insects on the surface.